I became interested in this man's family and his story when I began to add his war memorial gravestone to the Imperial War Museum's War Memorial Register. The family gravestone is unusually elaborate and wordy for Barnsley Cemetery. It seems that Thomas' father Matthew Corri Halton was the mayor of Barnsley from 1892 to 1894 and had been a doctor in the town since 1868, marrying a local girl, Lucy Ann Allen here in 1876. His section of the inscription reads, "Of Your Charity / Pray For The Soul Of / Lieutenant Surgeon Matthew C.S. 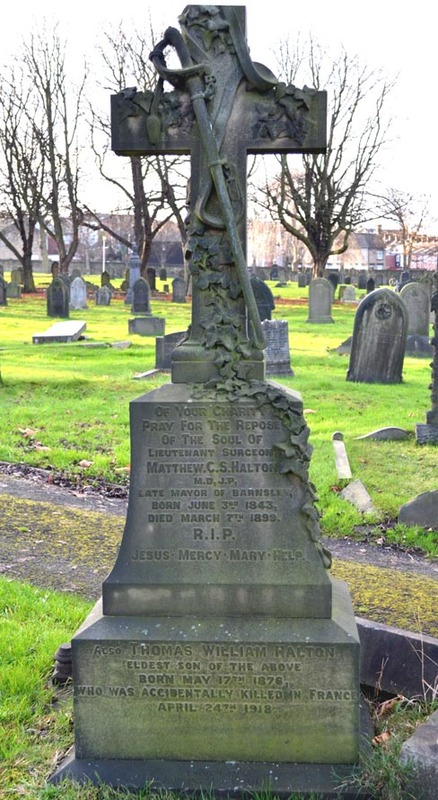 Halton / M.D., J.P. / Late mayor of Barnsley / Born June 3rd 1843 / Died March 7th 1899 / R.I.P. / Jesus. Mercy. Mary. Help." An obituary for Matthew in the British Medical Journal (25 March 1899) explained that he was originally from Mullingar, Ireland and his father had been the organist in the Catholic Cathedral there for fifty years. The family were living in Church Street in Barnsley in the 1881 and 1891 census returns. He died of influenza complicated by pneumonia leaving his wife, Lucy, two sons, Thomas and Patrick and a daughter Mary. Lucy Halton passed away herself in 1902 from the house in Hopwood Street where she had been living with Thomas and Mary in 1901. Her occupation was given as 'Living on own means' and she left £4,600 when she died. Her portion of the inscription reads, "Also of Your Charity / Pray for the Repose / of the Soul of / His Beloved Wife / Lucy Ann / Born March 21st 1848 / Died June 4th 1902 / R.I.P. / Jesus. Mercy. Mary. Help." Patrick had already left home and in 1901 was living with his uncle Michael Halton, who was also a doctor, in Leigh in Lancashire. Patrick's occupation in the census is given as Medical Student. He must not have found this career to his taste as in the 1911 census, after his marriage in 1909 to a Manchester girl Mary McDonnell, his occupation is given as Clerk to a Coal Merchant. The recently married couple don't yet have any children, but lodging with them is Patrick's brother Thomas, now aged 33, a 'Gentleman with private means'. The house at 9 Princess Road South, Moss Side, Manchester had seven rooms and is where Patrick and Mary were still living in December 1915 when he attested, although by then children Patrick (b.Dec 1911) and Mary (b.May 1913) had joined the family. Patrick was not mobilised, probably due to his age (he was 37 years old in 1915) until July 1917 when he joined the Royal Army Medical Corps as a Private, presumably being able to put his earlier medical training to good use. By then he had a third child, Matthew (b.Jan 1916). His records show that he attended some courses of training to be a medical orderly and that he was smart and efficient in this role. Thomas William Halton's army service records do not appear to have survived, but we know that he initially joined the Lancashire Fusiliers (Service no.30956) and was then transferred to the Labour Corps (Service no.276853). He may have knocked a couple of years off his age when he enlisted as we know he was baptised at the Holy Rood Church in Barnsley in May 1877, yet his Commonwealth War Graves Commission entry states that his age at death in 1918 was only 39 years (suggesting he gave a birth date in 1879). The inscription on the family gravestone shown above states that Thomas was 'accidentally killed in France April 24th 1918'. Little more can be gleaned from the additional documents on the CWGC site which say that he died of 'accidental injuries'. There is nothing in the Barnsley newspapers about his death, but that is not surprising as he and his brother had been based in Manchester for some years by this time. However his sister Mary Magdalen Halton had married locally to Harold Henry Dransfield, a Brewer, in August 1910 and was living in Darton in 1911. I am surprised there wasn't a death notice in the local newspaper at least. In 1939 Harold and Mary are living at 22 Paddock Road in Darton and Harold is a retired Moulder of Iron and Steel. They have one son, Richard (b.1911) who is an Engineers General Turner. Mary and Harold die in Darton in 1950 in their 70s within a few days of each other and are buried in the churchyard there. Patrick Halton pays 6 shillings and 1 penny (or at least agrees to pay, as I understand not everyone was charged) for a personal citation at the foot of Thomas' CWGC gravestone in Guarbecque Churchyard in France. Matching the style of the family stone in Barnsley Cemetery it reads 'R.I.P. Jesus Mercy, Mary Help". By this time Patrick's address was 255 Princess Road, Moss Side, Manchester. Patrick must also have put the above death notice in his local newspaper. Although it does confirm that Thomas remained in Manchester up to the time of his enlistment (tallying with his entry on Soldiers Died in the Great War) it still doesn't give any more information about his death. In 1939 Patrick and Mary are still living at the same address in Manchester. Patrick is now a Kitchen Clerk in a Restaurant and his two sons, Patrick and Matthew are both Insurance Agents. His youngest son, Phillip (b.1922) is blanked out in the 1939 Register on Find My Past as he may still be alive. We know that Patrick snr dies in 1942 as he is also buried in the family plot in Barnsley Cemetery. His inscription reads, "Also Patrick Allen / Dearly beloved husband / of Mary Halton / and son of / Dr Matthew C.S. Halton / born June 23rd 1878 / died Feby 3rd 1942 / Jesus. Mercy. Mary. Help." Thomas William Halton left a will and his effects amounted to £2551 8s 3d. His executor was an accountant, William Peckett Moulton, who was also named on his entry in the Army Register of Soldiers' Effects. A Google search of his name gave me a hit on the Derbyshire War Memorials site. Thomas is remembered at Mount St Mary's College in Spinkhill in Derbyshire, which was a Jesuit school in the 19th century. It is about 25 miles from Barnsley so Thomas must have been a boarder. There is no other information about his schooling on the site however. He does not appear to have ever married and is not noted as having any particular occupation in any census return in which he appears. All in all he's still quite a mystery.